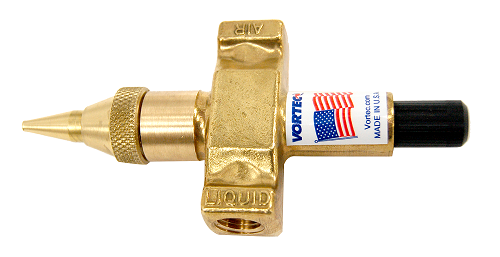 Vortec Spray Nozzles provide ultra-fine droplet-sized sprays for evaporative cooling, atomization, humidification and wetting. Superior to conventional hydraulic and piezoelectric nozzles, spray nozzles produce spray patterns that can be widely diffused or directed. The liquid stream is entrained by high velocity compressed air to create a range of micron-level spray droplets, resulting in greater surface coverage than conventional nozzles. With this more efficient use of the liquid, spray nozzles accelerate air-liquid interaction to give more effective cooling, humidifying, wetting and dust control.